We have 20 items on-tap, offering craft beers, ciders, and sours. We also have a wide assortment of NYS wines, NYS spirits, and domestic bottled beers. Enjoy a soft pretzel, a meat and cheese board, or other light dish while sipping your favorite beverage. Relax in our newly remodeled tasting room or unwind on the deck while looking at beautiful Keuka Lake! Join us for music every Friday night. Weekly performers are listed under our events calendar. Hope to see you soon! 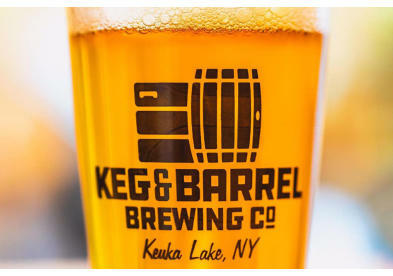 Live Music at Keg & Barrel Brewing Co.